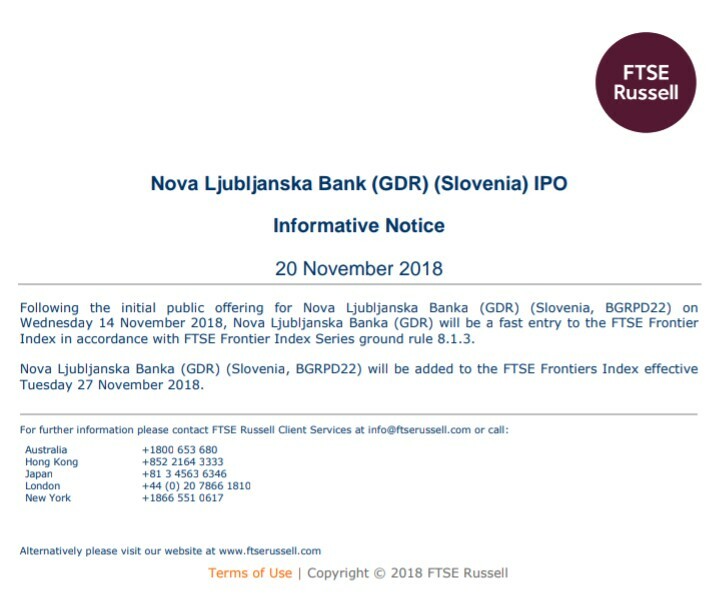 Slovenia’s Nova Ljubljanska Banka (NLB) will be added to the FTSE Frontier Markets Index following its successful initial public offering (IPO) last week, according to index-compiler FTSE Russell. FTSE released a Formative Notice on Tuesday 20th November confirmed that NLB will be a “fast entry” into the FTSE Frontier Markets Index, with the date of Tuesday 27th November being quoted as the day it will be added to the Index. Slovenia sold a 59% stake in the bank at €51.5 per share, which has been state-owned since 2013, effectively valuing the company at €1.03bn ($1.17bn). The company was listed on both the Lubjana and London Stock Exchanges Wednesday 14th November. It is expected that the government will sell up to 75% of the bank by the end of 2019, but will look to retain a portion of shares that will allow it to remain as the largest shareholder.